Our service is unquestionable. We believe that for the best service you need to have the highest regard for your products as well as commitment to providing knowledge and answers to any questions asked. Continuous supply of all year round. Stocked Items- quick supply of regular design fittings nationally. Prompt supply of custom design fittings including drawings and questions. Free on site assembly in Sydney metropolitan area and only labor and accommodation cost for interstate customers on request. 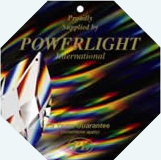 There is 5-year Replacement Guarantee applicable to Powerlight products. Refer to condition and terms set out in trading agreement.